Category 4 Hurricane Iniki, Hawaii's most notable hurricane. This list contains every tropical cyclone that had a somewhat notable effect on the State of Hawaiʻi. Hurricane Emilia passing by Hawaiʻi as a Category 4 hurricane. Radar image of Hurricane Jimena passing by south of Hawaiʻi as a tropical storm. 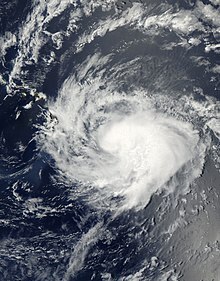 August 2007: Hurricane Flossie passed within 100 miles (160 km) of the Big Island of Hawaii bringing rain and tropical storm-force winds to the island. August 2008: The remnants of Hurricane Hernan brought moisture to the island of Hawaii causing cloud and shower activity. October 2009: Hurricane Neki caused minor damage to the Northwestern Hawaiian Islands, striking the Papahānaumokuākea Marine National Monument as a tropical storm. Hurricane Iselle approaching Hawaii as a minimal hurricane. December 2010: Tropical Storm Omeka brushed Lisianski Island as a weak tropical storm, although no damage was reported. July 2013: Tropical Storm Flossie passed just 5 miles (8.0 km) north of Kauai as a weak tropical depression. October 2014: Hurricane Ana skirted just south of the Hawaiian islands, passing 85 miles (137 km) southwest of Kauai as a category 1 hurricane. Damage was limited to a few downed trees. August 2015: Hurricane Hilda passed within 200 miles (320 km) southeast of Island of Hawaiʻi as a tropical depression. August 2015: Hurricane Kilo passed within 410 miles (660 km) southeast of Island of Hawaiʻi as a tropical depression, it brought enhanced moisture into Hawaii, leading to locally heavy rainfall in that state. August 2015: Hurricane Loke brushed Pearl and Hermes Atoll as a minimal hurricane, although no damage was reported. August–September 2015: Hurricane Ignacio passed about 230 miles (370 km) northeast of Maui and Molokai as a category 1 hurricane, causing only minimal impacts. September 2015: Hurricane Jimena passed about 220 miles (350 km) northeast of Oahu as a weak tropical depression, it brought scattered heavy rains to Hawaii. September 2015: Tropical Storm Malia brushed Maro Reef as a weak tropical storm, although no damage was reported. September 2015: Tropical Storm Niala passes to the southeast of the Big Island, bringing tropical storm force winds to the island. Flood and High Wind Advisories were released. July 2016: Moisture associated with the remnants of Hurricane Blas brought showers to Hawaii. Peak daily rainfall totals primarily ranged between 1 to 2 in (25 to 50 mm) and did not cause any serious flooding. July 2016: Large swells as high as 15 ft (4.6 m) generated by the remnants of Hurricane Celia affected the east-facing shores of the Hawaiian Islands. These swells produced rough surf that caused two drowning deaths on the southeastern shore of the island of Oahu on July 16. July 2016: Hurricane Darby made landfall in southeast Island of Hawaiʻi as a minimal tropical storm. Darby brought heavy rain and widespread flash floods to the windward sides of the Hawaiian Islands, however, overall damage was minor. July 2016: Remnant moisture from Hurricane Georgette brought heavy rain to Oahu on July 31 but caused only minor flooding. August 2016: The remnants of Tropical Storm Howard moved across the main Hawaiian Island group on August 7, dropping up to 2 in (51 mm) of rain over portions of Kauai, Oahu, and Maui, with minor flooding occurring on northwestern Oahu and northern sections of Maui. September 2016: Hurricane Madeline passes to the southeast of the Big Island as a weakening tropical storm, producing heavy rain and gusty winds. Total rainfall accumulations amounted up to 5–11 inches (13–28 cm) across the Big Island. September 2016: Hurricane Lester passed slowly to the northeast of the islands as a category 1 hurricane. Its outer rainbands produced heavy showers and minor flooding over the leeward slopes of the Big Island and portions of east Maui. September 2018: Hurricane Norman passed about 300 miles (480 km) to the northeast of the main Hawaiian islands as a weakening Category 1 hurricane. A high surf warning was issued for the eastern shores of Maui and the Island of Hawaiʻi, although no damage was reported. September 2018: Hurricane Olivia made landfall in northwest Maui as a minimal tropical storm, becoming the first storm on record to make landfall on the island since reliable records began. As Olivia continued towards the west, it then made a second landfall on the northeast coast of Lanai with heavy rains and gusty winds. Several homes were evacuated in Maui due to the threat of flooding, though overall damage was relatively minor, with some reports of downed trees and flooded roads. In total, 63 tropical cyclones have affected Hawaiʻi since official record-keeping began in 1949. At least 29 people have died in Hawaiʻi as a result of tropical cyclones since 1949. Snow on Mauna Loa and Mauna Kea after storm passes Hawaii Island. Before Hurricane Iniki in 1992, a standard homeowner's insurance policy with extended coverage provided hurricane coverage. Since Iniki, many insurance policies exclude hurricane and a separate hurricane policy is required to obtain hurricane coverage. ^ a b Central Pacific Hurricane Center. "Tropical Cyclones in the 1800s". United States National Oceanic and Atmospheric Administration's National Weather Service. Retrieved June 8, 2012. ^ a b Businger, Steven; M. P. Nogelmeier; P. W. U. Chinn; T. Schroeder (2018). "Hurricane with a History: Hawaiian Newspapers Illuminate an 1871 Storm". Bull. Amer. Meteor. Soc. 99 (1): 137–47. doi: 10.1175/BAMS-D-16-0333.1. ^ a b c d e f Central Pacific Hurricane Center. Tropical Cyclones During the Years 1900-1952 (Report). United States National Oceanic and Atmospheric Administration's National Weather Service. Retrieved June 8, 2012. ^ a b Central Pacific Hurricane Center. The 1957 Central Pacific Tropical Cyclone Season (Report). United States National Oceanic and Atmospheric Administration's National Weather Service. Retrieved June 9, 2012. ^ Central Pacific Hurricane Center. The 1958 Central Pacific Tropical Cyclone Season (Report). United States National Oceanic and Atmospheric Administration's National Weather Service. Retrieved June 9, 2012. ^ Central Pacific Hurricane Center. The 1959 Central Pacific Tropical Cyclone Season (Report). United States National Oceanic and Atmospheric Administration's National Weather Service. Retrieved June 9, 2012. ^ Central Pacific Hurricane Center. 1963 Tropical Cyclones in the Central North Pacific (Report). United States National Oceanic and Atmospheric Administration's National Weather Service. Retrieved June 9, 2012. ^ Central Pacific Hurricane Center. 1966 Tropical Cyclones in the Central North Pacific (Report). United States National Oceanic and Atmospheric Administration's National Weather Service. Retrieved June 9, 2012. ^ Central Pacific Hurricane Center. The 1970 Central Pacific Tropical Cyclone Season (Report). United States National Oceanic and Atmospheric Administration's National Weather Service. Retrieved June 9, 2012. ^ a b Central Pacific Hurricane Center. The 1971 Central Pacific Tropical Cyclone Season (Report). United States National Oceanic and Atmospheric Administration's National Weather Service. Retrieved June 9, 2012. ^ a b Central Pacific Hurricane Center. The 1972 Central Pacific Tropical Cyclone Season (Report). United States National Oceanic and Atmospheric Administration's National Weather Service. Retrieved June 9, 2012. ^ Central Pacific Hurricane Center. The 1976 Central Pacific Tropical Cyclone Season (Report). United States National Oceanic and Atmospheric Administration's National Weather Service. Retrieved June 9, 2012. ^ Central Pacific Hurricane Center. The 1978 Central Pacific Tropical Cyclone Season (Report). United States National Oceanic and Atmospheric Administration's National Weather Service. Retrieved June 9, 2012. ^ a b Central Pacific Hurricane Center. The 1982 Central Pacific Tropical Cyclone Season (NOAA Technical Memorandum NWSTM PR-29). United States National Oceanic and Atmospheric Administration's National Weather Service. Retrieved June 8, 2012. ^ a b Central Pacific Hurricane Center. The 1983 Central Pacific Tropical Cyclone Season (NOAA Technical Memorandum NWSTM PR-30). United States National Oceanic and Atmospheric Administration's National Weather Service. Retrieved June 8, 2012. ^ Central Pacific Hurricane Center. The 1985 Central Pacific Tropical Cyclone Season (NOAA Technical Memorandum NWSTM PR-32). United States National Oceanic and Atmospheric Administration's National Weather Service. Retrieved June 8, 2012. ^ Central Pacific Hurricane Center. The 1986 Central Pacific Tropical Cyclone Season (NOAA Technical Memorandum NWSTM PR-33). United States National Oceanic and Atmospheric Administration's National Weather Service. Retrieved June 8, 2012. ^ a b Central Pacific Hurricane Center. The 1988 Central Pacific Tropical Cyclone Season (NOAA Technical Memorandum NWSTM PR-35). United States National Oceanic and Atmospheric Administration's National Weather Service. Retrieved June 8, 2012. ^ Central Pacific Hurricane Center. The 1989 Central Pacific Tropical Cyclone Season (NOAA Technical Memorandum NWSTM PR-36). United States National Oceanic and Atmospheric Administration's National Weather Service. Retrieved June 8, 2012. ^ Central Pacific Hurricane Center. The 1991 Central Pacific Tropical Cyclone Season (NOAA Technical Memorandum NWSTM PR-38). United States National Oceanic and Atmospheric Administration's National Weather Service. Retrieved June 8, 2012. ^ a b c Central Pacific Hurricane Center. The 1992 Central Pacific Tropical Cyclone Season (NOAA Technical Memorandum NWSTM PR-39). United States National Oceanic and Atmospheric Administration's National Weather Service. Retrieved June 8, 2012. ^ "Costliest U.S. tropical cyclones tables update" (PDF). National Hurricane Center. Retrieved January 28, 2018. ^ a b Central Pacific Hurricane Center. The 1993 Central Pacific Tropical Cyclone Season (NOAA Technical Memorandum NWSTM PR-40). United States National Oceanic and Atmospheric Administration's National Weather Service. Retrieved June 8, 2012. ^ a b c d Central Pacific Hurricane Center. The 1994 Central Pacific Tropical Cyclone Season (NOAA Technical Memorandum NWSTM PR-41). United States National Oceanic and Atmospheric Administration's National Weather Service. Retrieved November 28, 2007. ^ Hablutzel, Benjamin C; Weyman, James C; Rosendal, Hans E; Jendrowski, Paul A; Hoag, Jonathan D; Tanabe, Raymond M; Central Pacific Hurricane Center. The 1999 Central Pacific Tropical Cyclone Season (NOAA Technical Memorandum NWSTM PR-46). United States National Oceanic and Atmospheric Administration's National Weather Service. Retrieved June 9, 2012. ^ Kodama, Kevin R; Rosendal, Hans E; Hablutzelm Benjamin C; Jendrowski, Paul A; Eum, Daniel; Central Pacific Hurricane Center. The 2000 Central Pacific Tropical Cyclone Season (NOAA Technical Memorandum NWSTM PR-). United States National Oceanic and Atmospheric Administration's National Weather Service. Retrieved June 9, 2012. ^ Nash, Andy; Craig, Tim; Farrell, Robert; Rosendal, Hans E; Central Pacific Hurricane Center. The 2003 Central Pacific Tropical Cyclone Season (NOAA Technical Memorandum NWSTM PR-51). United States National Oceanic and Atmospheric Administration's National Weather Service. Retrieved June 9, 2012. ^ Nash, Andy; Craig, Tim; Matsuda, Roy; Powell, Jeffery; Central Pacific Hurricane Center. The 2004 Central Pacific Tropical Cyclone Season (NOAA Technical Memorandum NWSTM PR-52). United States National Oceanic and Atmospheric Administration's National Weather Service. Retrieved June 9, 2012. ^ a b Nash, Andy; Proton, Victor; Farrell, Robert; Matsuda, Roy; Central Pacific Hurricane Center. 2005 Tropical Cyclones in the Central North Pacific (NOAA Technical Memorandum NWSTM PR-53). United States National Oceanic and Atmospheric Administration's National Weather Service. Retrieved June 9, 2012. ^ Kimberlain, Todd B; Wroe Derek; Knabb, Richard D; National Hurricane Center; Central Pacific Hurricane Center (January 10, 2010). Hurricane Felicia (PDF) (Tropical Cyclone Report). United States National Oceanic and Atmospheric Administration's National Weather Service. p. 3. Retrieved May 13, 2012. ^ "Rescuers find body of Kauai hiker swept away by rushing river". Hawaii News Now. Hawaii News Now. August 9, 2014. Retrieved December 12, 2017. ^ "Remnants of Fernanda to bring humidity, possible thunderstorms". Hawaii News Now. July 24, 2017. Retrieved December 12, 2017. ^ Birchard. "Hurricane Hector Intermediate Advisory Number 33A". Central Pacific Hurricane Center. National Oceanic and Atmospheric Administration. Retrieved August 8, 2018. ^ Lane Possibly Breaks Hawaii Tropical Cyclone Rainfall Record (Public Information Statement). National Weather Service Office in Honolulu, Hawaii. August 27, 2018. Archived from the original on August 27, 2018. Retrieved August 27, 2018. ^ "1 death from Hawaii storm Lane reported on Kauai". Hawaii News Now. Associated Press. August 29, 2018. Retrieved August 30, 2018.